This may have been a sponge boat or could have been used for commercial purposes as well. 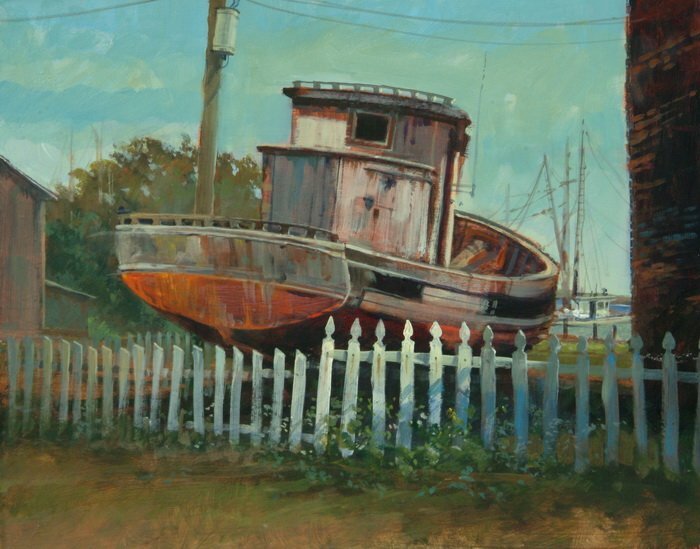 It sits in Apalachicola, Florida which is a delightful town near the panhandle of Florida. If you’re looking for a place to paint and relax this is a great destination. It’s “Old Florida” at it’s best. The boat has been there for decades or so it seems. It will never feel the Gulf on its hull again as many of the planking has been rotted away. It’s a great static display however and one that caught my eye to paint for our PBS television series. The painting was done using only three colors plus white – ultramarine blue, Indian yellow, and alizarin crimson. I especially liked the way the light came across the fence casting blue shadows on the otherwise warm colors of white. 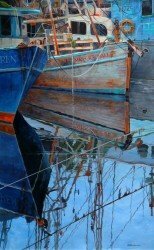 I did two paintings of this boat. The other one is 8×10″.